“Grey Court School is a mixed comprehensive for 11 to 18-year-olds. We opened a sixth form in 2014. We’re based in Ham which is one of the most deprived areas in London, despite being in the borough of Richmond upon Thames. Students come from a mixed background: there’re different cultures and races. Our free school meal percentage is in line with the national average and our last Ofsted rating was Outstanding. I’m the careers adviser at Grey Court and at another school. We’ve run careers events for the last 10 years. We wanted to link in more with our alumni to get role models for our sixth formers. Any alumni work we had done before was very ad hoc. There wasn’t a central place that we could go to contact alumni from specific sectors. We’ve been working with Future First for three years now. We wanted to get access to more role models. We also wanted work experience offers for our sixth formers and to support any events that we’re running in school. We just thought the advice would be so much better if it was coming from a real role model to the students. My colleague Ian and I manage the alumni portal but we regularly talk about it to the rest of the staff body and ask if anyone wants to invite alumni in to support their subject area. Teachers in the school are receptive and supportive. Whenever we do any events in the sixth form we ask if they’d like to invite alumni to come in and support it. 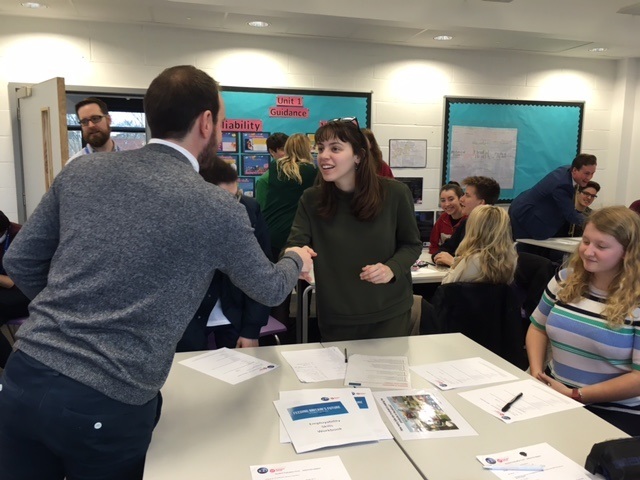 We hold a careers networking event for our Year 9s in which we run various workshops. We have about 20 alumni per session. The students split into pairs and work with the alumni who come from a range of careers. It’s important because it opens them up to careers they don’t know about – careers that are beyond their immediate reach. We get such brilliant feedback from students. Parents even say students talk about the alumni they meet at home. The fact that students have to speak to strangers puts them out of their comfort zone. When they hear that someone came to this school they want to know about their time here and what kind of student they were. It puts them at ease because they can start with questions about the school. We run mock interviews with Year 10 students: they’re interviewed by alumni, which is great because it exposes them to people from the working world. We did involve volunteers in these events before but it was very random – really ad hoc. We found volunteers through teacher connections. It wasn’t very professional. Now that we have the alumni network we can be more specific about who we want and who is suitable for events, rather than it just being whoever you can get to volunteer. Now we can be selective about who we bring in to speak to the students. Future First has encouraged us to communicate with our alumni network regularly. We send out a bulletin to alumni telling them what’s going on in school and any updates about teachers. They want to know what’s going on. We also thank them a lot, which is so important. They do a lot for us and we’re really grateful. Our alumni programme is mainly about careers and inspiring our students but we do a bit of fundraising. We have a Grey Court tree and alumni can buy leaves. We also held a reunion where alumni paid to come and visit – it was great and I think the alumni got a lot out of it. One of my favourite things we do is a friends and founders evening for our Year 12s. They bring in their CVs and talk to people from different careers, and they try and find work experience placements. Quite a few students have gained experience from our alumni. One ex-student who works in Kingston hospital has offered placements to four students. Last year we had our first student go off to medical school. He could talk about what he’d done on the placement with the former student. I think a large part of him gaining the university place was his work experience with the former student – he wouldn’t have got that experience without the alumni network. He’s now at Manchester studying medicine. We also had a female student who met an alumna at the Year 12 evening. She had regretted not taking photography for GCSE. She did a photography placement with a former student and it completely made her rethink her future – she’s decided to study art based on this experience. Because of the alumni she has followed her passion and interests.